Memories by AmyInKy: How about something girly? 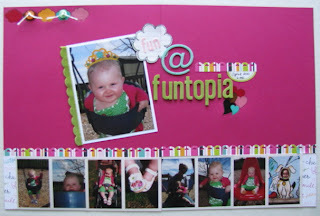 One of the fun things about having an adorable niece, is that I get to make some cute girly layouts now. I used one of the American Crafts kits I picked up at Shannon Zickel's fundraiser crop in March for this layout. The papers are from the "Teen" line. I added some Paper Trunk alphas and Sassafrass Lass chipboard with a scrap of felt. It also helped that I printed two photos on one 4x6 print. I had so many photos of Reese from this day, that I ended up printing two 4x6 photo collages with four photos on each. Then, I cut them apart and pieced them together to make a row along the bottom of the following 2-page 8.5"x11"layout. I love everything about this little girl - from her head to her toes! The crown in the main photo is actually a rub-on! 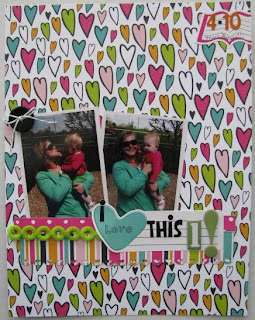 I also used my Noel Mignon "Playdate" kit to make another Reese page. This one highlights some of my favorite photos from her party after her Baptism. Isn't she adorable in those sunglasses! You'll be seeing a lot of Reese photos in future layouts! It must be so fun for you to do girly layouts! She is just adorable. I can totally picture you spoiling her! Love those sunglasses...she is a doll! Great lo's too!